Historical parallelism – because two or more significant events happened in the past, then one similar event happening again will lead to another of the corresponding event. And the most recent example, being bandied around by critics of current president Rodrigo Duterte, is that the University of the Philippines (UP) Men’s Basketball Team’s UAAP (University Athletic Association of the Philippines) finals stint in 1986 (32 years before the team got there again!) happened in the same year as the ouster of then-president Ferdinand Marcos. Of course, several commentators were quick to point out that UP’s finals appearance occurred several months AFTER the ouster. And logically speaking, one should be able to smell the post hoc fallacy from the very start. One should also be able to call out the difference in circumstances then and now. This, however, really should come as no surprise, if you’ve been busy following the Opposition. Whether or not they have more substantial propositions and arguments, making references to the past is not only convenient, it is easy. Filipinos are so easy to scare: they have an aversion to risk that is debilitating and prevents them from venturing out into an unknown, but potentially rewarding, future. They have a deference to “elderly” symbols and authority by age that prevents them from being truly independent thinkers, and from truly learning from the mistakes of their ancestors and predecessors. They would rather talk of glory days gone by, rather than doing actual work to make sure they can truly bring them back. The other perceptible, but more subtle, half of the parallelism drawn between UP’s UAAP finals appearance and the ouster of Marcos, is that whoever is pushing it is telling people to “prepare for another inevitable ouster”, or to go “do their ‘patriotic duty’, on their behalf”. One can’t help but get the feeling that whoever these people are, they would rather see others get their hands dirty as cannon fodder for their cause, than do the dirty work themselves out in the streets. 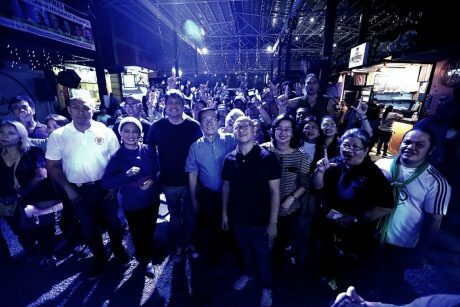 Conveniently, this sort of behavior is also seemingly associated with Yellowtards, arguably the loudest among the rattling cans in the current Opposition. It seems, however, that the most obvious hindrance to the Opposition having more weight is the lack of credibility of the Yellowtards. For all the historical parallelism and throwbacks that the Opposition likes to indulge in, they conveniently gloss over the snippets of history that don’t make them look good. Like how, for example, not one single Marcos has yet to be put in a jail cell in the Philippines, where it counts. Or how both Aquino presidents mothballed potentially beneficial development projects started by their predecessors – without even completing one of their own. Or how Aquino the Son’s incompetence and unnecessary politicking had caused a long list of deaths that didn’t need to happen (Yolanda). Fortunately, it seems certain Filipinos are starting to divorce themselves from such so-called chains of the past. Some of them don’t care about the bogeymen of, and deference to, the past anymore; they came of age in a time when everything was supposed to be prosperous, clean, inclusive, free, and democratic, and yet, wasn’t all it’s cracked up to be. The past is a lesson, not a state to go back to. If things weren’t done in their time-appropriate manners, then perhaps people should take accountability for them, not blame others for their own neglect/failures. Unfortunately, the shallow opposition offered and espoused primarily by Yellowtards, communists, and other so-called “activists” belong in the past. So they should stay there. As for the future, retain what works, cast off what does not. On the contrary, a lot of major changes occur after EDSA 1 – the prices of basic commodities rocketed up; GOCC’s were privatized without any good effect to ordinary citizens; electric bills also went up by probably 1000 percent; the communists back in shape; we lost our seas; drugs became rampant; criminality reached its highest rate and worst of all, the poor became poorer and rich became richer. These changes are for real, aren’t they? Such harbinger theory wishful thinking is probably just a way of day-dreaming up a yellow Christmas for all them Lenin-loving Leni fans out there. Wouldn’t it be great to have the Yellows back in power again to have all those annoying Build Build Build projects halted as they not just put Duterte in a positive light (juxtaposed against Noynoy’s under-spending track record), they also worsen the already bad traffic conditions – esp. as Christmas shopping season is already in the air? By and large, the truth is not merely a fierce battle with ignorance and fallacy, but, first and foremost, a combat with our own preconceived ideas and aprioristic conceptions. YellowTards want to relish on the past, because the U.S./C.I.A. , ousted the late , Pres. Marcos Sr. for them, and handed them over the government power. The Fake Vice President Lugaw Robredo was “elected” in the Vice President ” position with the help of the crook COMELEC Chief, Andres Bautista, and using the HOCUS PCOS and SMART SWITIK machines. ..The will of the Filipino people was hijacked ! After which, the Aquino Cojuangco’s political running dogs: the Trililing Trillanes and the drug dealer/nymphomaniac Leila de Lima, tried to impeach the duly elected Pres. Duterte, and replace him with the Fake VP Lugaw Robredo. Their plans did not materialize. However, the COMELEC recount on the Vice Presidency is dragging thru the year, 2020. The crook in the Supreme Court named Caguioa is facilitating this recount delay. This is the true situation of our country. When the Aquino Cojuangco political axis took over. They raided the National Treasury. We are ruled by incompetent and corrupt leaders. There were many fake heroes, saints and martyrs, being peddled by the Aquino Cojuangco political propaganda machine media. The Cult of Personalities of these Aquino Fakes are highlighted even in our history books. OMG, what a dysfunctional country, we have now ! If there is anything I hate reading / hearing is the illogical pinoy sense of entitlement. Armed with that 1986 fact you mention the phrase I read was ” your move Ateneo”. As if there is any relation. As if there will be a domino effect. As if the label dictator really applies. The yellows just disagree with everything Duterte says and does simply because he is not one of them. They had their turn with the limp wristed, inexperienced , man child, mama’s boy. And how did that work out? Fuel their sense of entitlement even more to the point that they are trying to guilt Ateneo into throwing the series and ridiculing the annual championship because of their sense of entitlement. Limp wristed thinking indeed since that is a limp wristed way to get a championship. ” your move Ateneo”.